[140 Pages] Food Inclusions Market report categorizes the global market by Form, Type (Chocolate, Fruit & Nut, Confectionery, Cereal, Flavored Sugar & Caramel), Flavor, Application (Cereal, Bakery, Snacks, and Bars, Dairy & Frozen Desserts, Chocolate & Confectionery), and Region. 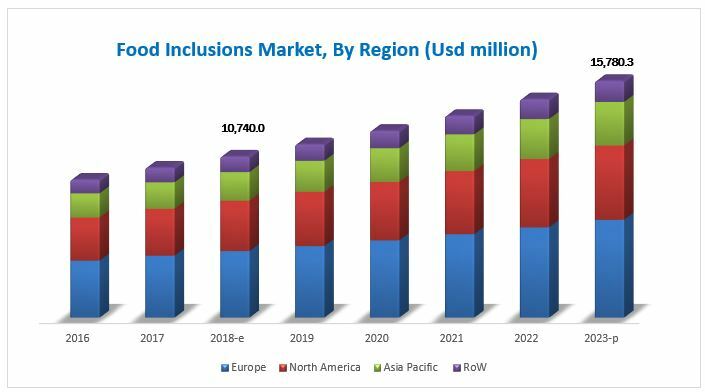 The food inclusions market was valued at USD 10.00 billion in 2017 and is projected to reach USD 15.78 billion by 2023, at a CAGR of 8.0% from 2018. The objectives of this study are to define, segment, and project the size of the food inclusions market based on type, application, form, flavor, and key region. This report includes the estimation of the market size for value (USD million). 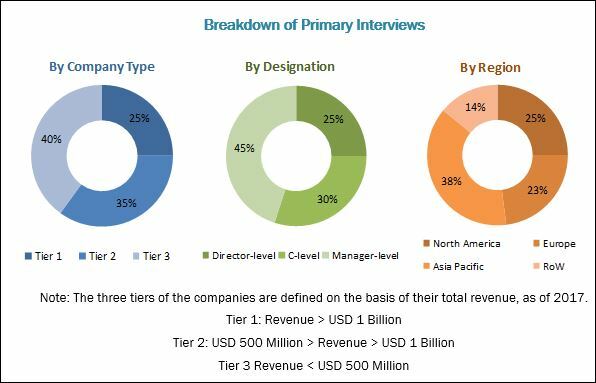 Both, top-down and bottom-up approaches have been used to estimate and validate the size of the food inclusions market and to estimate the size of various other dependent submarkets in the overall market. Key players in the market have been identified through secondary research (FAO, Bloomberg Businessweek, and companies’ annual reports). All percentage shares, splits, and breakdowns have been determined using secondary sources and verified through primary sources. The various contributors involved in the value chain of food inclusions include manufacturers, suppliers, distributors, importers, and exporters. The key players in the food inclusions market include Cargill (US), ADM (US), Barry Callebaut (Switzerland), Kerry (Ireland), Tate & Lyle (UK), AGRANA (Austria), Sensient Technologies (US), Puratos Group (Belgium), SensoryEffects (US), Taura Natural Ingredients (New Zealand), Georgia Nut Company (US), Inclusion Technologies (US), Nimbus Foods (UK), IBK Tropic (Spain), TruFoodMfg (US), FoodFlo International (New Zealand), and Confection by Design (UK). The food inclusions market is estimated at USD 10.74 billion in 2018. It is projected to reach USD 15.78 billion by 2023, at a CAGR of 8.0%. The growth in the food inclusions market is attributed to functional properties of food inclusions along with enhanced product appeal; clean label, non-GMO and allergen-free inclusions; and taste trends and responsive development of new flavor profiles offering new avenues for growth. The chocolate segment is projected to dominate the food inclusions market through the forecast period. The market for chocolate inclusions is largely driven by its flavor popularity and consumer inclination toward chocolate components in food products such as confectionery, ice cream, bakery, dairy, beverages, frozen desserts, and cereal products. 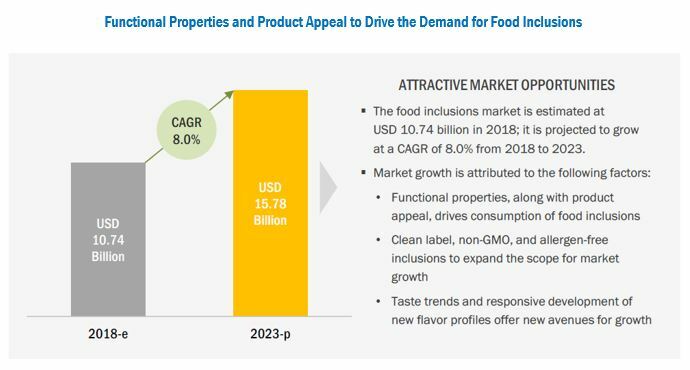 The food inclusions market, by application, was dominated by cereal products, snacks, and bars in 2018. Food inclusions, with their ability to enhance organoleptic properties and nutritional profile, are ideal ingredients for addition in cereal products, snacks, and bars, as they enhance product appeal. Consequently, inclusions are significantly consumed for use in products in this category, as their content has become the unique selling proposition (USP) and core factors of product marketing. The nut form of food inclusions is projected to grow at a higher CAGR between 2018 and 2023. Nuts are popular among end consumers and largely used in major food & beverage applications, including bakery, chocolate & confectionery products, dairy & frozen desserts, cereal products, snacks & bars, and beverage products. Furthermore, the addition of nuts not only adds to the flavor and texture but significantly contributes toward the nutritional aspects of food & beverage products, which drives the growth of nut form in the food inclusions market. The food inclusions market is characterized by leading companies driving the market growth. This report provides a qualitative analysis of the prominent market players and their preferred development strategies. Key players such as such Cargill (US), ADM (US), Barry Callebaut (Switzerland), Kerry (Ireland), Tate & Lyle (UK), AGRANA (Austria), Sensient Technologies (US), SensoryEffects (US), Taura Natural Ingredients (New Zealand), Georgia Nut Company (US), Inclusion Technologies (US), and Nimbus Foods (UK) have been profiled in the report. These leading players have adopted strategies such as expansions & investments, acquisitions, new product launches, joint ventures, and partnerships to explore new and untapped markets, expand in local areas of emerging markets, and develop a new customer base for long-term client relationships. This has not only enabled the key players to expand their geographical reach, but has also reinforced their market position by gaining a larger share in terms of revenue and product portfolios.